After teaching American Born Chinese for several years, I finally decided my (then) nine-year-old could handle it last fall. She loved it, so when Gene Luen Yang came to our local library, we had to pay him a visit. Unbelievably, we got there before anyone else and snagged a front row seat. Mr. Yang was already there and held a wonderful conversation with my daughter. He is truly an incredibly nice man and obviously a father of young children. Because he made such a great impression on her, my daughter wanted to read everything by Gene Luen Yang. She enjoyed Secret Coders, so I next grabbed her both Boxers and Saints as well. Admittedly, I didn’t know much about either book. She read them and made a few comments about them being a little bloody, then asked me to read them, too. How could I say no? I’m a fan of the author as well. My daughter was right–these are bloody, violent books! However, they are also very, very good. Boxers takes place between 1894 and 1900. Historically speaking, it deals with the Chinese uprising against Western invaders as well as Christian missionaries. This all actually happened. Yang focuses on Bao, a young man whose family, friends, and village has suffered at the hands of foreign influences and even Christians. They are marginalized, bullied, and even killed for not conforming to outside forces. Bao loves Chinese opera, specifically the many gods and goddesses featured therein. As you know from American Born Chinese, Yang is particularly talented at infusing Chinese mythology into his stories. Of course, in the case of Bao, these are not myths. These gods and goddesses are reality, and he is soon able to harness their power. He teaches others to harness their power as well, and this is the foundation of their strength against the bigger, better armed invaders that they confront. The book culminates in the city of Peking. There Bao must make his most difficult of decisions and face his ultimate challenge. Boxers is a violent, complex book. While I don’t regret letting my (then) nine-year-old read it, I should have done a little research and provided a bit more guidance as she devoured it. It presents the very ugly, brutal side of colonialism and even Christian evangelism. However, it also brilliantly depicts Bao compromising his “gut” feelings of right and wrong versus what he thinks is best for his nation. Bao kills innocent Christian women and children in this book, but from his perspective, they are not innocent. They are foreign devils trying to destroy his culture and people. Yang himself is a Christian, so please don’t get on his case about this. He’s depicting a character rooted in historical events and using him to explore obvious complexities that actually occurred. The Chinese who did not conform were beaten and killed mercilessly. The Boxers did the same to their adversaries. Rest assured, Yang does not deal with any of this lightly. He clearly put a lot of thought into how he wanted to execute this story. I found it thoughtful, tasteful, and fair in relation to historical precedent. I will admit, though, because of Yang’s drawing style, the violence jarred me. This would have been a very different book by any other artist. While there is blood, head shots, beatings, and even mass murder, Yang doesn’t make any of it gratuitous. At the same time, though, he also doesn’t shy away from what’s happening. At one point, Bao decides to burn a church with Christians inside of it. Yang doesn’t soften this horrific event, but he also doesn’t sensationalize it. As you can tell, Boxers deeply resonated with me. I completely recommend it. I do think it’s okay for children, but I would urge you to guide them through it (unlike what I did). There is much to be learned from the book, to be sure. I’ll review Boxers‘ accompanying title, Saints, soon! 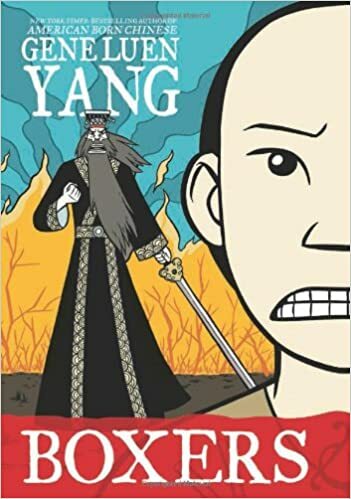 This entry was posted in Book Reviews and tagged arts, book, boxers, comic book, entertainment, fiction, gene luen yang, graphic novel, read, review.